Taurus July 2016 Horoscope suggests that family and psychological issues will dominate over career issues. Improvement in emotional strength will naturally augment your career prospects. Taurus, this is not the month for you to be obstinate and stubborn and others will direct your growth. You should be flexible enough to adapt yourself to the new environment. You will have the benefit of different viewpoints which will be a boon in some ways. Socially the Taureans will be more adept and this will help you in the other aspects of life. The July 2016 monthly astrology predictions suggest that many chances for career development arise during the month. You should make sure that they are emotionally compatible and are not affecting harmony in the family environment. The Moon will give you the necessary strength to overcome problems in your profession and business. Financial situation is challenging during July 2016 as Mercury is not favorable for the Bulls. Money will flow, but you have to accept the pace at which it will happen. Your monetary fortunes are guided by your own decisions and you have to be meticulous in your planning. Taurus, your personal outlook will be a great factor in fiscal success and enough research should go into this aspect. Large ticket expenses and investments should be done at a later date. You should offer new financial instruments to attract your clients. Risky investments by senior members of family will give good returns to the Taureans in July 016. Your spouse is not that lucky and has to be circumspect in financial matters. Money from unexpected sources is likely towards the end of the month due to the beneficial aspects of Mercury and Jupiter. The 2016 love horoscope predicts that July 2016 is a good month for matters of love for the dating Taurus. Committed partnerships will move ahead. Your social skills will be of help in new love relationships. Family members will go along with your decisions in matters of partnerships. Taurus, children may be a source of worry due to their unpredictable behavior and temperament. This month is propitious for the Taureans for buying or selling a home. Money will be spent on furnishing the house and for buying personal luxuries. 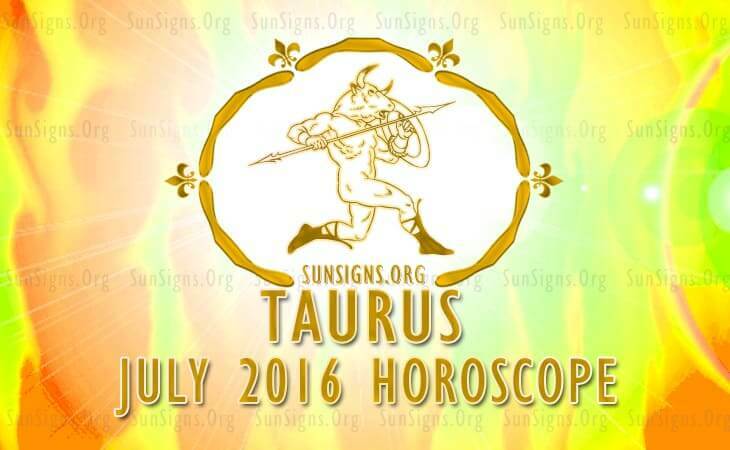 The July 2016 forecasts for Taurus show no problems are expected on health matters this month. Sportsmen and athletes will do well in their fields of interest. You should eat a lot of green vegetables like spinach, broccoli, kale and basil and lotus root to improve your blood circulation. The Taurus horoscope for July 2016 predicts that with your excellent thinking you will be able to balance both home and profession with ease.